Brownsville, Texas, Feb 13, 2019 / 03:01 pm (CNA/EWTN News).- City commissioners in McAllen, Texas have ordered Catholic Charities of the Rio Grande Valley (CCRGV) to vacate their migrant respite center within 90 days, after complaints from neighbors. “I am disappointed with today’s decision but thankful for the continued support of the City of McAllen, the wonderful community, and Mayor Jim Darling,” said Sister Norma Pimentel, CCRGV director, in a Feb. 13 statement. The 16,000-square-foot center, currently housed in a former nursing home, has been accommodating hundreds of migrants a day coming from across the U.S.-Mexico border since December 2018, when CCRGV relocated to the space from a smaller downtown building. The respite center, which is staffed by volunteers and mainly offers food, showers, and basic necessities, has changed locations several times since 2014. The mayor and two city commissioners voted Feb. 11 to remove Catholic Charities from the current site; two commissioners voted against the proposal, and two commissioners were not present at the meeting, according to The Monitor. Despite voting to move the center, Mayor Jim Darling the next day publicly committed to helping CCRGV find a new location for migrant respite operations in McAllen. A spokeswoman for the Diocese of Brownsville told CNA that CCRGV does not yet have concrete plans for a new location. The Respite Center in McAllen in its various locations has helped close to 150,000 migrants since 2014, sometimes up to 300 a day, Pimentel has said. Most of the people the center helps are women and children who have been released by Immigration and Customs Enforcement with a court date to consider their request for asylum. City commissioners had reportedly received complaints from several residents living near the respite center, who described “their peaceful neighborhood being upended by constant traffic and strangers wandering the streets, likely coming from the respite center,” according to The Monitor. The residents reportedly claimed to support the center’s mission to help migrants, but not in a residential area. Sister Pimentel was invited to a roundtable discussion with President Donald Trump Jan. 10, during the president’s visit to the U.S.-Mexico border in McAllen. At the time, Trump was visiting Texas in an effort to drum up support for $5.7 billion in funding for a wall along the border with Mexico, amid a government shutdown that began over funding for the wall. Pimentel later said she was disappointed that she didn’t get to speak to the president during the discussion. 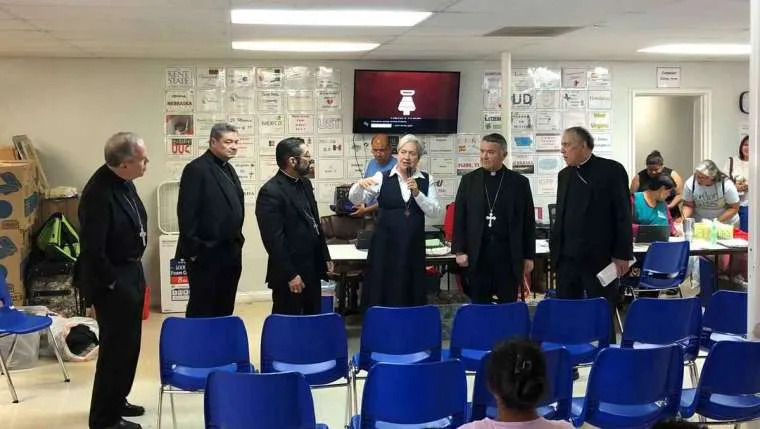 A delegation of bishops, including Bishop Robert Brennan, auxiliary bishop of Rockville Centre, visited the border in July 2018 and toured the Humanitarian Respite Center in McAllen.